As Shippaiman becomes a huge sensation for what's intended to be a short-term series, Ryoma Takeuchi and Rio Uchida both showed up to play as alternate versions of old school Kamen Rider characters. Takeuchi plays as an alternate version of Kotaro Minami and Uchida plays as an alternate version of Reiko Shiratori. Since Shippaiman happens in the "What If Universe" of Toei or just anything goes, a timeline distortion happens. In this episode, the Kingdom of Shocker accidentally opens a dimesional gate to Shippaiman's dimension in the year 2016. They find out that they didn't take over Japan. Instead, it's the corrupt Prime Minister Nobita and his family. But seeing that Japan's defenses have been lowered ever since Tokusatsu heroes were banned save for Shippaiman. General Jack and Shadow Moon inform their leader the Great Leader that Japan of 2016 is theirs for the taking. General Jack and Shadow Moon are now played by Mitsuomi Takahashi and Yasuka Saito appeared as the main villains that Shippaiman and Black RX are forced to fight against. In this episode, Shippaiman tries to battle General Jack and Shadow Moon who have appeared in the episode. The alternate version of trademark old school villains that appear in cameo are namely Maribaron (played by Nao Nagasawa), Ambassador Darkness (played by Ryuji Sainei), Apollo Geist (played by Hiroki Aiba), Marshall Armor (played by Yuki Yamada), Saint Sword Bilgenia (played by Yutaka Kobayashi), Takeshi Asakura/Kamen Rider Ouja (Masaharu Inoue), Kyoji Murakami/Rose Orphnoch (Kento Handa) and High Priestess Bishium (played by Ayumi Kinoshita). The "Great Leader" is played by Masaharu Inoue who appears as a man dressed in red with his face exposed. In this episode, Shippaiman leads Japan's army against Shocker's villains only to find out that they're so ill-prepared. The villains all defeat Shippaiman's forces and they march towards the capital of the dystopian Tokyo. The move that Winsbraindraft prepared is to really send back the Kingdom of Shocker back to where they belong. Kotaro manages to get help from Winsbraindraft that find out where the leak is. Knowing that they can't win against the Kingdom of Shocker generals head on, they fool the generals into the same portal. Black RX manages to jump into the portal and prevent their dimension from corroding with Shippaiman's continuity. 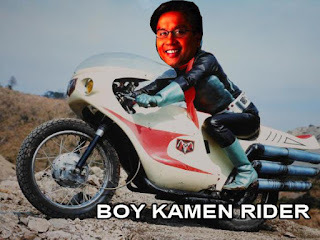 Shippaiman is yet left in shame as the whole problem of the Kamen Riders' colliding with Shippaiman's dimension was the fault of President Nobita playing with a dimensional machine. The machine gets destroyed in order to avoid any continuity errors. Yet Kotaro leaves a note it may not be the last of their meeting. However, the episode as rushed as it may be gave producers an idea. Producer Shinichiro Shirakura of the Super Hero Taisen Series announced that a massive crossover film this Fall would be called "Shippaiman's Misadventures in the Kingdom of Shocker" which will run for 2 hours of total nonsense. The plot involves Shippaiman getting sucked into the same dimension as President Nobita still hasn't learned his lesson. This time, be read to see different people play as different Kamen Riders. Confirmed is that cast members from Kyoryuger up to Ninninger will play as alternate versions of the Kamen Riders. Added, the Zyuohgers may have a movie called "Zyuohger Movie 2: Shippaiman Cometh" which will be aimed for older audiences who still enjoy Super Sentai to a certain extent.